Product #21935 | SKU SSM-BC10 | 0.0 (no ratings yet) Thanks for your rating! 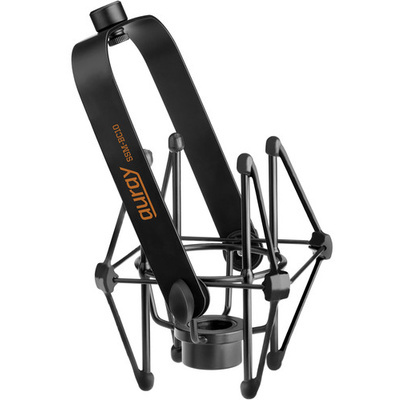 The black matte SSM-BC10 Microphone Suspension Shockmount from Auray is designed to keep your front-address microphone free from vibrations and noise that can often affect broadcast and voiceover applications. The heavy-duty bands isolate your microphone, eliminating the vibrations that can travel through your mic stand or broadcast arm. The shockmount is equipped with a standard 5/8"-27 threaded socket and fits most mic stands and broadcast arms. Its locking knob and protective inner ring secure your mic in place while protecting its finish. The swivelling basket allows for precise microphone placement.